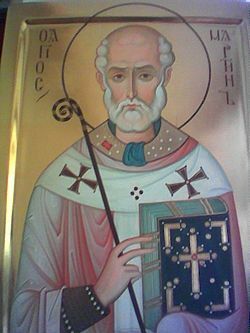 Saint Martin of Tours (c. 316, Savaria, Pannonia – November 8, 397, Candes, Gaul) was a bishop of Tours who has become one of the most famous and recognizable Roman Catholic saints. As a soldier in the Roman army, Martin shared his cloak with a freezing beggar and received a vision of Christ which moved him to renounce military life and become a monk. He later became an abbot and then a bishop. He is known for his stand against heresy and destroying pagan shrines. In his monastic and clerical life, he simultaneously exhibited high standards of Christian humility and compassion. His life was recorded by a contemporary, Sulpicius Severus, who attributed many miracles to Martin. Following his death, Martin's shrine soon became an well known pilgrimage site, and he was a particularly important figure to the Merovignian and Carolingian kings. Many traditions of European and Latin American folklore developed also around him. The Catholic Church celebrates his feast day on November 11. The Basilica of Saint Martin of Tours was attacked and sacked as an object of idolatry during the Protestant Reformation and destroyed during the French Revolution. Its location was unearthed in the twentieth century, and a new church has now been built on the site. He is a patron saint of France and of soldiers, as well as a figure often cited by pacifists justifying their conscientious objection to war. Martin was born at Savaria, Pannonia (today Szombathely, Hungary). His father was a senior officer (tribune) in the Imperial Horse Guard, a unit of the Roman army. Martin was named after Mars, the god of war, which Sulpicius Severus interpreted as "the brave, the courageous." His father was later stationed at Ticinum, Cisalpine Gaul (modern Pavia, Italy), where Martin grew up. At the age of ten, against the wishes of his parents, Martin became a catechumen—a candidate for Christian baptism. At this time, Christianity had been made a legal religion, but it was still far from accepted among the higher echelons of society, especially in the Roman army, where the cult of Mithras was still much stronger. When Martin was 15, as the son of a veteran officer, he was required to join a cavalry regiment himself and thus, around 334, was stationed at Ambianensium civitas or Samarobriva in Gaul (modern Amiens, France). While Martin was still a soldier at Amiens, he experienced a vision that became the most-repeated story about his life. He was at the gates of the city of Amiens with his soldiers when he met a scantily dressed beggar. He impulsively cut his own military cloak in half and shared it with the unfortunate man. That night he dreamed of Jesus wearing the half-cloak Martin had given away and heard Jesus say to the angels: "Here is Martin, the Roman soldier who is not baptized; he has clad me." 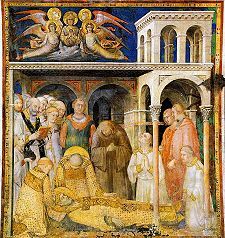 In some versions of the story, when Martin woke, his cloak was restored and was later preserved among the relics collected of the Merovingian kings of the Franks. 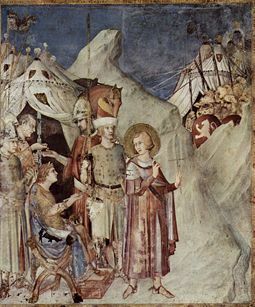 Martin renounces his weapons, fresco by Simone Martini, Cappella di San Martino, Assisi, Italy. The dream confirmed Martin in his piety, and he was baptized at the age of 18. He served in the military for another two years until, just before a battle against the Gauls at Worms in 336, Martin determined that his faith prohibited him from fighting. "I am a soldier of Christ," he reportedly stated, "I cannot fight." He was charged with cowardice and jailed, but in response to the charge, he volunteered to go unarmed to the front of the troops. His superiors planned to take him up on the offer, but before they could do so, the invaders sued for peace, and the battle never occurred. Martin then was released from military service. Martin made his way to the city of Tours, where he became a disciple of Hilary of Poitiers, a chief proponent of Trinitarian Christianity and opponent of the Arianism of the ruling Visigothic nobility. When Hilary was forced into exile from Poitiers, Martin returned to Italy, reportedly converting an Alpine brigand on the way and also confronting the Devil himself. In Milan, Archbishop Auxentius, who was an Arian Christian, expelled Martin from the city. According to the early sources, Martin decided to seek shelter on the island then called Gallinaria, now Isola d'Albenga, in the Tyrrhenian Sea, where he lived the solitary life of a hermit. Substantially later, with the return of Hilary to his episcopal see at Portiers in 361, Martin joined him and established a monastery nearby, at the site that later developed into the Benedictine Ligugé Abbey, the first such establishment in Gaul. The monastery became a center for the evangelization of the country districts, and Martin traveled and preached throughout Western Gaul. In 371 Martin was acclaimed bishop of Tours, where he impressed the Christians of that city by the enthusiasm with which he had pagan temples, altars, sacred trees, and sculptures destroyed. Despite his willingness to take action against pagans and Arian heretics, Martin defended the followers of the dualistic heresy of Priscillianism, on grounds that the issue was an ecclesiastical one not under the jurisdiction of secular authorities. The First Council of Saragossa had condemned Priscillianism, and Priscillian and his supporters had fled. When charges against the fugitives were then brought before Emperor Magnus Maximus, Martin went to the imperial court of Trier on an errand of mercy to remove the issue from the secular jurisdiction of the emperor. At first, Maximus acceded to his entreaty. However, after Martin had departed, he yielded to the solicitations of the Catholic Bishop Ithacius and ordered Priscillian and his followers to be beheaded (385). They thus became the first avowed Christians executed for heresy. Deeply grieved, Martin at first refused to communicate with Ithacius. However, when he went again to Trier a little later to ask pardon for two rebels, Maximus would only promise it to him on condition that he would make his peace with Ithacius. To save the lives of his clients, he consented to this reconciliation, but afterward reproached himself bitterly for this act of weakness. After a last visit to Rome, Martin went to Candes, one of the religious centers he had created in his diocese, when he became seriously ill. Ordering himself to be carried into the presbytery of the church, he died there, probably in 397, at the age of about 81. His body, taken to Tours, was enclosed in a stone sarcophagus, above which his successors built a simple chapel. Martin of Tours became even more important after his death than he was in life. The early life of Saint Martin was written by Sulpicius Severus who knew him personally. It is filled with accounts of miracles and his dramatic encounters with the Devil. Some of the miracle stories follow familiar themes such as casting out devils, healing the lame, and raising the dead. Others, however, are more unusual. For example, while Martin was in the process of burning down the pagan temple, he is depicted as miraculously turning back the flames from a house which adjoined the structure. In another instance, the Druids agreed to fell their sacred fir tree if Martin would stand directly in the path of its fall. He did so, and it miraculously missed him. From the late fourth century to the late Middle Ages, much of Western Europe, including Great Britain, engaged in a period of fasting beginning on the day after Saint Martin's Day, November 11. This fast period lasted 40 days, and was, therefore, called "Quadragesima Sancti Martini—the 40 days of Saint Martin. On Saint Martin's eve and on the feast day, people ate and drank very heartily for a last time before they started to fast. This fasting time later evolved into "Advent." When Bishop Perpetuus took office at Tours in 461, the little chapel over Martin's grave was no longer sufficient for the crowd of pilgrims it was already drawing. 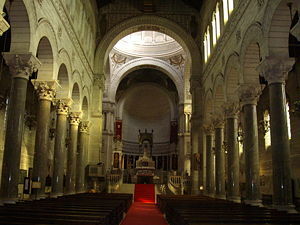 A basilica dedicated to the saint was thus completed in 470. Saint Martin's popularity can be partially attributed to his adoption by successive royal houses of France. Clovis, King of the Salian Franks, promised his Christian wife Clotilda that he would be baptized if he was victorious over the Alemanni. He credited the intervention of Saint Martin with his success, and with several following triumphs, including the defeat of Alaric II. The cult of Saint Martin continued to be closely identified with the Merovingian monarchy. The later bishop, Gregory of Tours, wrote and distributed an influential Life filled with miraculous events of the saint's career. Martin's cult survived the passage of power to Merovingians' successors, the Carolinginian dynasty. The Abbey of Saint-Martin at Tours was one of the most prominent and influential establishments in medieval France. 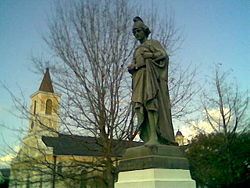 Charlemagne awarded the position of its abbot to his friend and adviser, the great English scholar and educator Alcuin. Saint Martin's basilica, however, was destroyed by fire on several occasions, and both it and the monastery were sacked by Norman Vikings in 996. Rebuilt beginning in 1014, the shrine again became a major stopping-point on pilgrimages. In 1453 the remains of Saint Martin were transferred to a magnificent new reliquary offered by Charles VII of France and Agnes Sorel. The basilica was attacked and sacked as an object of idolatry by Protestant Huguenots in 1562 during the Wars of Religion. It was virtually destroyed during the French Revolution, during which it was used as a stable and then utterly demolished. Its dressed stones were sold by revolutionary authorities in 1802 when two streets were opened on the site, to ensure it would not be rebuilt. Excavations in 1860 uncovered the basilica's remains and a new Basilique Saint-Martin was consecrated July 4, 1925. According to legend, the humble Saint Martin was reluctant to become bishop, and he hid in a stable filled with geese. However, the noise made by the geese betrayed his location to the people who were looking for him. On Saint Martin's Day (November 11), children in Flanders, the southern and north-western parts of the Netherlands, the Catholic areas of Germany and Austria participate in paper lantern processions. Often, a man dressed as Saint Martin rides on a horse in front of the procession. The children sing songs about Saint Martin and about their lanterns. The food traditionally eaten on the day is goose. In recent years, the lantern processions have become widespread, even in Protestant areas of Germany and the Netherlands, despite the fact that most Protestant churches do not recognize Saints as a distinct class of believers from the laity. In the Belgian province of East-Flanders (Aalst) and the west part of West Flanders (Ypres), children receive presents from Saint Martin on November 11, instead of from Saint Nicholas on December 6 or Santa Claus on December 25. There are also lantern processions, for which children make lanterns out of beets. In Malta, children are sometimes given a bag full of nuts, hazelnuts, oranges and tangerines in honor of Saint Martin. In old days, nuts were then used by the children in their games. The parish of Baħrija is dedicated to Saint Martin and on his feast a fair with agricultural produce and animals is organized. In Portugal, where the saint's day is celebrated across the country, it is common for families and friends to gather around the fire in reunions called "magustos," where they typically eat roasted chestnuts and drink wine and other local beverages. Stained Glass Decoration of Saint Martin of Tours Church in Vegreville, Alberta, Canada. Many churches in Europe are named after Saint Martinus. 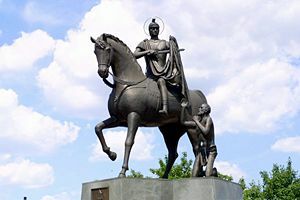 Martin of Tours is the patron saint of Szombathely, Hungary with a church dedicated to him, and also the patron saint of Buenos Aires. In the Netherlands he is the patron of the cathedral and city of Utrecht. In Latin America, he has a strong popular following and is frequently referred to as San Martín Caballero, in reference to his common depiction on horseback. San Martín de Loba is the name of a municipality in the Bolívar Department of Colombia. Saint Martin, as San Martín de Loba, is the patron saint of Vasquez, a small village in Colombia. Although Martin had no connection with wine-making—indeed he forbade wine to his monks—he is now credited with a prominent role in spreading wine-making throughout the Touraine region and facilitated the planting of many vines. Critical scholars believe that the Greek myth of Aristaeus discovering the concept of pruning the vines after watching a goat eat some of the foliage has been applied to Martin. He is also credited with introducing the Chenin Blanc grape varietal, from which most of the white wine of western Touraine and Anjou is made. Martin Luther was named after Martin of Tours, as he was baptized on November 11, 1483. 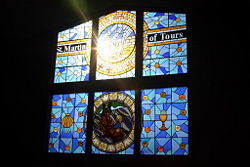 Many Lutheran congregations are thus named after Saint Martin, although Lutherans normally name congregations after the evangelists and other saints who appear in the Bible and are hesitant to name congregations after post-Biblical saints. Martin of Tours is the patron saint of the U.S. Army Quartermaster Corps, which has a medal in his name. Ironically, he is also frequently appealed to by Christian pacifists, who, like him, refuse to serve in the military. Saint Martin of Tours Catholic Encyclopedia, newadvent.org. On the Life of St. Martin by Sulpicius Severus, Translation and Notes by Alexander Roberts. From: A Select Library of Nicene and Post-Nicene Fathers of the Christian Church, Second Series, Volume 11, New York, 1894. 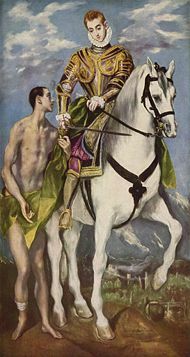 History of "Martin of Tours"
This page was last modified on 28 August 2018, at 14:56.